After New Mexico Black Chamber of Commerce chairman Michael McNair investigated why some black farmers in the state experienced water shortages, he learned about aquaponics from watching videos on YouTube. In a moment of epiphany, he realized that aquaponics would work not only for these farmers, but for the entire state of New Mexico. Since, he has become president of the New Mexico Aquaponics Association, and helped spearhead New Mexico House Bill 201, which adds tilapia and hybrid striped bass to the list of fish regulated by the New Mexico Department of Game & Fish. House Bill 201, sponsored by State Representative Alonzo Baldonado (R-8th) was passed on February 18 and now heads to the Senate, where it is sponsored by State Senator Peter Wirth (D-25th). “It should sail through the Senate because there’s no money attached to it,” says McNair. The importance of adding two approved species of fish is vital for the fledgling aquaponics industry in New Mexico, he says. Illustrating this point is Albuquerque’s Golden Grown Panaderia, a restaurant which features its own in-house aquaponics garden. But since owner Chris Morales can currently only raise goldfish, this limits the nutrients that are provided to his soilless garden, and it means he is unable to sell the fish for consumption. But if the Senate approves the bill, the door will open for Morales and others in the state to more fully engage in aquaponics. But, according to Highfield, there is now burgeoning interest in aquaponics among New Mexicans. In fact, one of the largest tilapia producers in the U.S., AmeriCulture, Inc., is located in Animas, New Mexico and extensively utilizes aquaponics. Another prominent aquaponics operation in the state is Something Fishy in Jemez Springs. They, along with Highfield, are the only three in New Mexico to hold exemption permits to raise tilapia and/or hybrid striped bass in an aquaponics operation. But tilapia and hybrid striped bass are both warm water fish, and would eventually freeze to death upon escape to outside waterways. Highfield and others have been working with Dan Brooks, director of the New Mexico Department of Game & Fish, in changing the law to allow tilapia and bass. “He’s been very accommodating,” Highfield says. Because of its abundance of geothermal waters, Highfield believes New Mexico is a perfect place for aquaponics operations (which require warm water). But the aquaponics industry in the state won’t be able to grow until tilapia is added to the approved list. But McNair, who is a former police chief and moved to New Mexico from Maryland, prides himself on knowing how to navigate through and around bureaucracy. “Aquaponics and aquaculture was not their priority,” he says. But now, the state is on the verge of a new era for aquaponics. “This will revolutionize New Mexico,” says McNair, who’s excited about adding diversity to the state’s agriculture portfolio. “Most of the food consumed in New Mexico is not grown in New Mexico—what’s done here is cattle, green chilies and red chilies.” He also cites statistics showing that most farmers in the state are in their 70s, and have families that don’t have much interest in taking over traditional farms. Currently, New Mexicans spend $4.5 billion on food brought in from somewhere else—McNair’s goal is to reduce this by 25 percent. He sees aquaponics as one way to realize this objective. “My other hope is to change rules and regulations that impact urban farming,” he says. 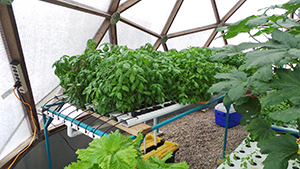 Highfield views a growing aquaponics industry as an important component of increasing food security and economic development in New Mexico. Aquaponics is one of the topics he teaches at Santa Fe Community College, and he’s eager to train new students. Sign up for email updates on the latest indoor agriculture news from Seedstock!